STATE COLLEGE, Pa. -- 29 October 2009 -- AccuWeather.com reports there will be no "big horror" classics on Halloween night. Saturday in Cannon County will start out cloudy with a little rain into the early afternoon. Highs will be in the low 60s. 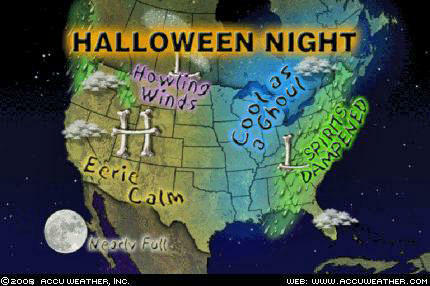 Halloween Night will welcome trick-or-treaters with a moonlit sky and temperatures dropping down into the low 40s. The scariest thing nationwide is the storm that will dampen spirits over part of the East. A deadly silence will befall the Southwest and the southern Plains. The wind will howl across the northern Plains, but don't worry about any ghastly cold up that way. The Northwest will be somewhat unsettled, but not too frightening.